Free download TimeBell latest version. It automated computer reminders and many repetitive actions for you. Once created in TimeBell , you never have to worry about them again. What a time saver , the computer remember to have this program up and running , even if you can not be there. TimeBell with reminders and advanced capabilities , makes it simple . The TimeBell program is easy to understand even for someone new to computers will be very easy to start. There’s even a convenient desktop calendar. TimeBell New in this version : – function to enable or disable the execution of the tasks of the ” TimeBell task window ” by clicking the right mouse button on the desired task and choose from the menu to enable or disable . All these tasks can be executed once or periodically (hourly, daily, weekly, monthly, yearly). All tasks can be performed in any combination, together or separately. The number of TimeBell tasks is unlimited. At start up, TimeBell notifies you about any missed tasks. You can view the list of tasks on present day at starting program. If you use multiple computers, you can transfer the data file with all the tasks of TimeBell between them via external storage or through Internet. 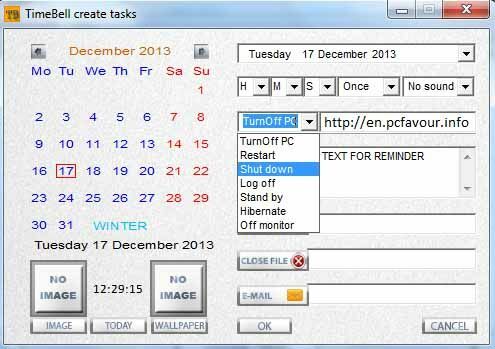 You can even create TimeBell tasks remotely through Internet. In order to see tasks in more detail or edit a task, just double-click on the task with left mouse button to display a window with all the details. check update for new version TimeBell (is active by default). Check updates automatically – when startup TimeBell or manually select in menu “Check for Updates now”. For disable this function please select in menu program “Disable automatically check updates”.